I haven’t yet but I probably could eat a whole jar in one sitting. They don’t last long in my house. 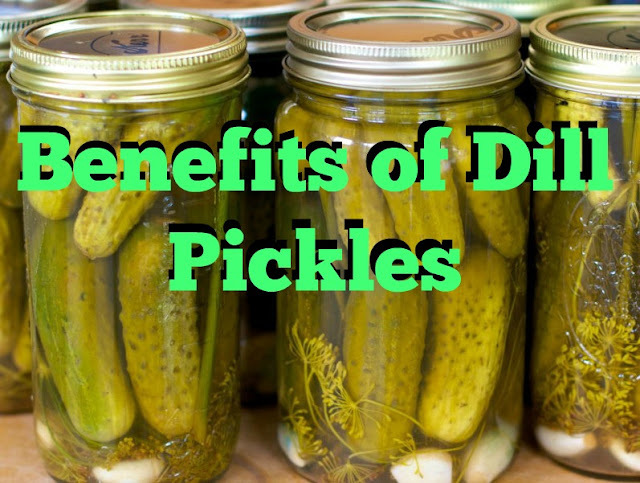 I’ve been eating pickles a lot lately and thought maybe there are some benefits to eating Dill pickles. Dill pickles are cucumbers that have been fermented in brine made up of water, vinegar, salt and dill. Dill pickles are actually low in calories. One dill pickle spear contains just 4 calories, and a 1-cup serving of dill pickle slices contains only 19 calories. Dill pickles don't contain any fat or cholesterol. If you want to flavor your food without adding unhealthy amounts of fat, dill pickles are one option. Dill pickles might replace mayonnaise on a sandwich or burger. You can even replace high-fat salad dressing with dill pickle slices to enhance the flavor of a tossed green salad. Dill pickles are made from cucumbers. Cucumbers are a healthy source of fiber, and pickling the cucumbers doesn't eliminate the fiber. One cup of dill pickle slices contains almost 2 grams of fiber, and one dill pickle spear contains 0.4 grams. Dill pickles also contain about 0.5 grams of iron per 1-cup serving. They contain small amounts of potassium, vitamin C and vitamin K as well. The primary drawback to eating dill pickles is the amount of sodium they contain. If you eat too much salt on a regular basis, it can increase your risk of kidney disease, high blood pressure and stroke. Certain brands of pickles offer a low-sodium version, which makes them more nutritionally sound. Because dill pickles have such a bold flavor, it only takes a small serving to flavor your food. Top a burger or sandwich with just two or three slices. Add just 1 tablespoon of chopped dill pickles to potato, pasta or tuna salad for the intense flavor without adding a large amount of sodium. Consider making your own dill pickles, which allows you to control how much salt you add. • Pickles have a long history -- one that takes us back to 2400 BC. It is believed that the Mesopotamians were picklers and that we have been pickling ever since. Pickles have been popular in England since the Middle Ages. • Some of the greatest people in history spoke highly of the crunchy snack. Aristotle thought that "cured cucumbers" had great healing properties while Julius Casear fed pickles to his men as he believed that they offered physical and spiritual strength. Cleopatra, known for her good looks, believed her beauty came from eating ample amounts of pickles. • Why Do Pregnant Women Crave Pickles? According to ThePregnancyQuestions.com, craving pickles can point to low sodium levels in your blood and some believe cravings for items like pickles happen when women are in need of certain nutrients. While the cucumbers and the dill used to make pickles contain essential vitamins and minerals, the finished product is high in sodium. You don't have to give up dill pickles, but they should be eaten in moderation.